Megan Dunne had no idea what her soccer career would develop into when she was introduced to the sport at a young age. Dunne said that she started out just kicking the ball around in the family backyard with her uncle. Dunne was registered for a local recreation league and needless to say, she had instant success. In Dunne’s very first game in the recreation league, she scored seven goals. That’s no misprint. She found the net a total of seven times in her first-ever organized soccer game. Dunne remained dedicated to the sport through her travel and recreation days and maintained that positive feeling and spirit after entering SDA in the fall of 2017. But there was no way Dunne thought she would continue the level of excellence that she displayed during her youth soccer days. Dunne scored 24 goals as a freshman in 2017. St. Dominic Academy head coach Jorge Hernandez followed Dunne when she was still in grade school and realized that Dunne was a special talent. But after scoring two dozen goals as a rookie, there was little room to go up. Or was there? Dunne was not complacent at all. She wanted to get better, doing a little bit of everything during the offseason to improve her game. Dunne also did a lot of running at a park near her home in Kearny. Hernandez believed that Dunne was thoroughly prepared for the start of her sophomore season, except for one aspect – her position on the field. Dunne was strictly a forward last year and Hernandez thought that the talented sophomore had a better opportunity to control the game from center midfield. Over her last four games, Dunne has been on fire. She scored four goals in a game against University Charter, three against McNair Academic, four against Dickinson and three in the NJSIAA Non-Public A North opening round 4-3 overtime win over Paramus Catholic to advance to take on top seed Immaculate Heart in the sectional quarterfinals. For her efforts, Dunne has been selected as The Hudson Reporter Athlete of the Weekfor the past week. Hernandez has enjoyed watching Dunne blossom this season. At press time, she now has 30 goals for the season, which is a gigantic achievement for a Hudson County girls’ soccer player. 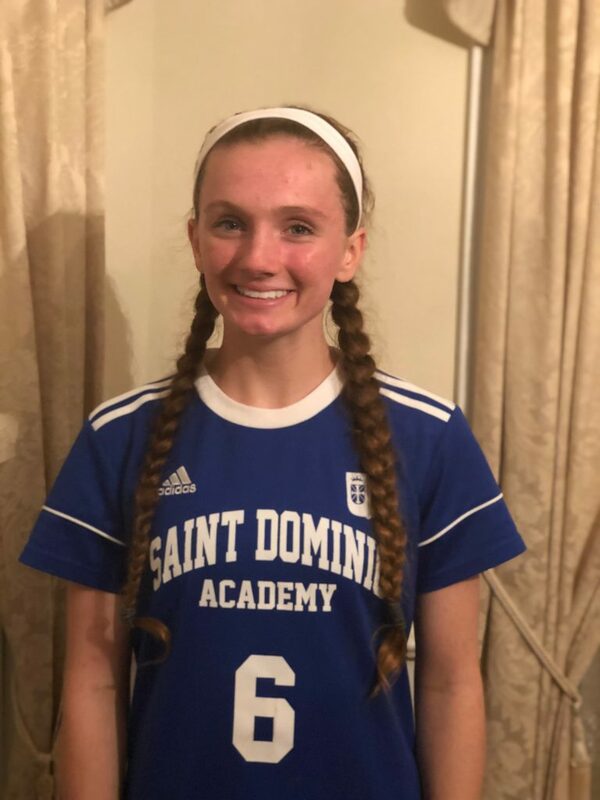 Dunne believes her mentality is the biggest reason why she’s scored an astounding 54 goals in two seasons of high school soccer. Dunne was asked what reaching the 30-goal milestone meant to her. Although she’s only a sophomore, Dunne knows that it’s never too early to start thinking about college. Dunne was a basketball player last year, but she’s thinking about concentrating on club soccer as well as outdoor track in the spring. Dunne runs all the sprints (100-meter dash through 400-meter run) for the famed SDA program. As of now, Dunne is content being a goal scorer, hell bent on getting to the elusive 100-goal plateau for her career.